A Bickle'76 in GTA Liberty City Stories.. The Bickle'76 is a supercharged taxi in Grand Theft Auto: Liberty City Stories. The Bickle'76 is an unlockable taxicab that is able to do taxi side-missions. It references the taxi driver Travis Bickle, who is the lead character of the Martin Scorsese film Taxi Driver, which was released in 1976, explaining the "'76" part of the vehicle's name. The Bickle'76 is unlocked after 100 taxi fares, which results the car spawning in front of the Mean Street Taxis taxi depot in Trenton, Portland. 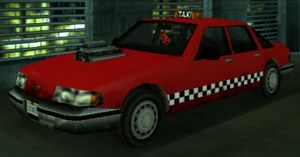 The Bickle'76 is based on the standard Taxi in GTA Liberty City Stories, which is a cross of a Chevy Caprice and a Ford Crown Victoria. It sports a supercharger, a permanent red paint job, solid grille, a checkered pattern on the lower sides, unique interior, and an air of fuzzy dices. Its taxi sign may not spawn properly, resulting in a "lightless" taxicab, giving it a more sporty appearance otherwise. Superior to its stock counterpart, the Bickle has the engine sound of a supercharged car. It possesses excellent acceleration and top speed due to it's RWD layout, different from the Taxi's FWD. However, the handling is below average. The strength is for the car is also superior to the Taxi, as giving it several good hits will cause smoke to come out of the engine. It is the only custom taxi not to be based off of a Cabbie. This page was last modified on 24 June 2013, at 09:19.